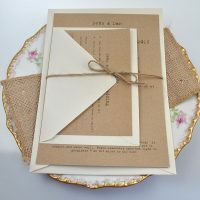 Categories: Wedding Maps, Vintage, Unique & Eco-Friendly Wedding Stationery. We have a very talented in-house designer who can create you a fantastic wedding map! Or you can email us a design you already have for us to print. 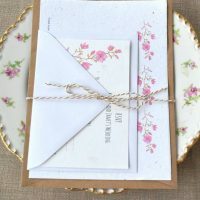 Wedding maps can be printed on recycled Kraft manilla card, recycled white card with petals here and there, or recycled white seed paper, and can be A6 or A5 size. We often also have other recycled card in stock – please ask us what we currently have available when you order if you would like a different colour. To start the process off, please order the type of card you would like your map to be printed on by completing the relevant boxes above. We need to know map size (A5 or A6), card material (recycled or seeded) and quantity. Please pay the Design Fee (if we are designing) to enable work to start on your map and quote your paper order number in the notes section during checkout (and your design order number if relevant). We will then get back to you to ask if you could send us over a rough idea of the design. Obviously it won’t be a technical map drawn to scale! So feel free to put on trees, church, landmarks etc. We need the draft because you will know your area better than we do! This doesn’t have to be perfect but have enough detail that our designer can create something wonderful for you! You can request changes at no extra cost. Once you are happy with it, we will print and get off to you as soon as we can! Please note that payment is required before design work can start. 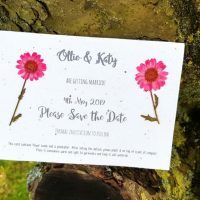 Want to use your own wedding map design? Not a problem! Simply order your card from the selection box above and then email over your design, with your order number.